It’s a strange problem when an IT department can put too many features on the system. Usually, it’s the other way around. More often than not, it is the IT department that is overwhelmed with requests. As the sixth largest brewery in the United States, Sierra Nevada Brewery used to have an overwhelming amount of IT requests. However, the tables have turned now that IT employees have begun using Inductive Automation software. Lewis explains that before implementing Inductive Automation’s FactorySQL and FactoryPMI software, they had a lot of requests – and those requests took a long time to develop. Accessing production system data was the biggest IT development hurdle. There just wasn’t an easy way to get the data. After implementing the new software, they were able to easily obtain data from anywhere in the plant. But it wasn’t initially easy to find those keys to IT bliss. Anytime IT makes a decision to put new software on a system, they need to proceed with caution to ensure no disruption to the plant’s production. Jonathan Swisher, system developer for Sierra Nevada Brewery, explained that as a test, they duplicated the addresses of everything they wanted to capture to FactorySQL and FactoryPMI to see how well it worked. The first experience with the software proved to be very user friendly. From a technical knowledge perspective, Swisher said the software had a very easy learning curve. It’s familiar to individuals trained in standard office technology such as web, Java, SQL databases, etc. 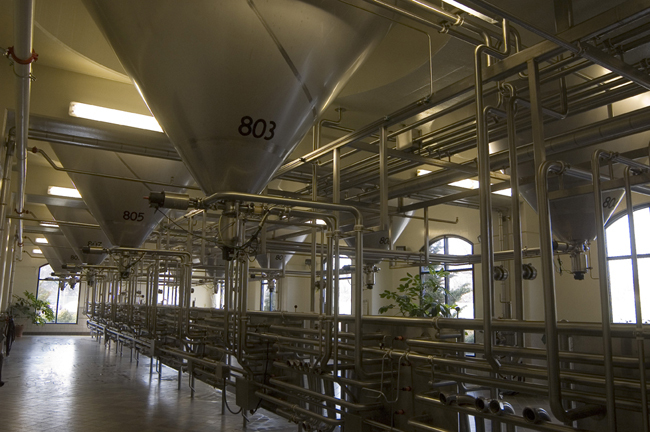 Ron Mayfield, system developer for Sierra Nevada Brewery, described how various interactions with the company’s SQL database had always been problematic in the past. When they rewrote all of the data to go through FactorySQL and FactoryPMI, life got easier. Sierra Nevada Brewery used to write tank status information on whiteboards around the plant. It was a time-consuming task, and often people forgot to write down information. 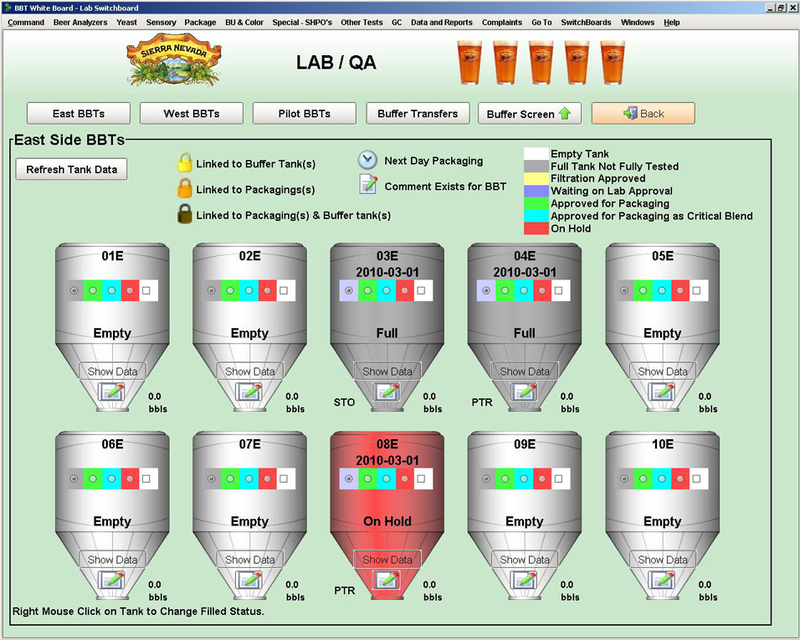 By building a tank status screen (shown above) through FactoryPMI, the brewery was able to coordinate its filtration to packaging workflow. Now each department knows at a glance what the other has done with each tank. By being able to work with the PLCs and the database, Mayfield said they soon realized that they could help all departments communicate seamlessly. One example he gave was their filtration to packaging workflow. Before a tank of beer is ready to be packaged, it has to be processed by the filtration department and then sampled and tested by the lab. Test information was then hand written on to a series of whiteboards around the plant. Packaging workers would first verify what had been tested according to the whiteboards, then begin their packaging process. Mayfield said they faced a very simple, but big problem: As the plant grew, people had to remember to write that information down in more and more places—a round trip of nearly half a mile! Now, with web-launched client screens, tank test data can be accessed by the lab, filtration and packaging workers. Lab test data is collected automatically from lab devices connected to FactorySQL, which are then combined with production line information on tank statuses, levels and other process data. The packaging department can see in an instant if a tank is ready to be packaged or not, and be certain that the screen is displaying realtime data. Lewis, Mayfield, and Swisher agreed that changes aren’t always easy. Especially when the IT department can make more features than their users can take in at a time. They’ve actually had to slow down the pace of how many features they add to the system, just so users get a chance to accept the new changes. Sierra Nevada Brewery is the sixth largest brewery in the United States. Their beer is produced exclusively in Chico, Calif., and is distributed in all 50 states and exported to Europe and Asia. Their flagship product is Sierra Nevada Pale Ale, complemented by a year-round program of seasonal and specialty beers. David Lewis is joining Inductive Automation for a webinar on Wednesday, March 17 at 9-10am PDT. The webinar will talk about how Ignition by Inductive Automation works with IT staff, not against them. To register, click here.